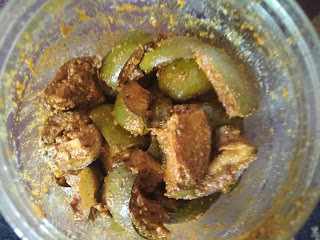 Mango Pickle or Aam Ka Achaar is a tangy and spicy condiment made from raw mangoes that adds an extra taste to the meal. In India most household make a whole year's stock of mango pickle in summers when raw mangoes are available in abundance.Pickle is a necessary side dish in all the Indian meals. Indian Cuisine is very famous for its spicy hot pickles with variety of vegetables. These pickles differ in taste from region to region with unique taste and flavor. Every summer almost all homes are busy in preparing these pickles. Everyone love the north Indian version of mango pickles for their nice flavor and mustard oil taste.